Knowing how to register a company in Nigeria is a major concern for entrepreneurs. However, this knowledge leads them to a lot of legal terms that confuses them. For instance, LLC, ltd, Ultd (Do not panic, we will break down all these corporate acronyms in another post), etc. Now the thrust of this article is about getting you acquainted with steps to register your own company. Yes, you can do it today. First, the law is that any two or more persons may form and register a company by complying with the requirements of the Companies and Allied Matters Act. After my uncle disengaged from the Nigeria Army, he decided to venture into the business world as a petroleum marketer. So he inquired from his lawyer what it entails to venture into the business. The lawyer told him he needed to register a company. The business was set up and now flourishing. This post will focus on how to register a limited liability (Ltd) company as this is usually the major type of registration done by the majority. Further, the law says that no company, association, or partnership consisting of more than twenty persons shall be formed for the purpose of carrying on any business for profit or gain by the company, association or partnership unless it is registered as a company. That may be a bit complex. The point is that you and your friends or family members can decide to form or register your company and I will tell you the steps to register your company in Nigeria today. Decide on the kind of business you need to establish. There are three kinds of companies – limited by shares, limited by guarantee, and unlimited. Obtain director’s means of identification i.e. Permanent Voter Card, Biodata Page of International Passport, or Driver’s licence. Ensure your directors are persons of integrity. Company directors of a company are appointed to manage the day to day affairs of the company. The shareholders are stakeholders in the company. Shareholders take part in the decision making of the company. They own the company by subscribing to shares. Obtain shareholders’ residential address, phone numbers, email. Shareholders’ means of Identification – Permanent Voter Card, Biodata Page of International Passport, or Driver’s licence. You need consent of the registrar general of CAC to register names with words i.e. chambers of commerce (unless it is a company limited by guarantee); misleading, offensive or undesirable; violates a trademark or business name; federal, national; regional; state; government of the federation or a state; ministry or department; cooperative; holding; group; or building society; etc. Subscribers shall take not less than 25% of the authorized share capital. The memorandum contains the names, address, share capital, liability, directors particulars, subscribers, and objectives of the company. Certain professions need proficiency certificate before anyone can register such a business. Although CAC removed proficiency certificate in 2017. However, it is advisable that you have proficiency certificate where your business needs one like a hospital, Chartered Secretaries Firm, etc. Appoint a Lawyer, chartered account or member of Institute of Chartered Secretaries of Nigeria or anyone who has been a Company Secretary for at least 5 years. A public company must have a Company Secretary. Commission an artist to wax a common seal for your company after registration by CAC. 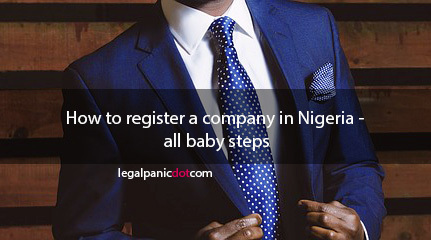 So, let’s go deep on how to register a company in Nigeria. This is very important. You need a lawyer to deal with the rigours of dealing with regulatory authorities such as CAC, FIRS, or any other regulatory authority.